I found this great little article on Twitter, of all places. One of my author buddies linked to it and being the curious cat that I am, I followed the link and came across this delightful little library. And when I say little, I mean… little. Ha ha. Offbeat Earth provided us with a peek into the world’s smallest library, and its as charming as a red British telephone booth. No, I mean it. It’s actually IN a telephone booth. 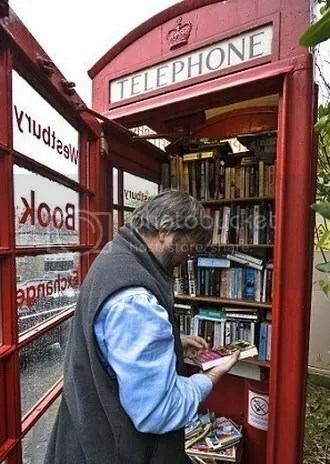 You see, Somerset, England has the privilege to boast a remodeled red phone booth (bought for just a pound, mind you), that was turned into a small, quaint, very private library, which the town residents loyally use to swap books, movies, AND music! Impressive huh? The box boasts a collection of over 100 books, which is pretty impressive, considering its size. I love it. And not only because any British box reminds me of Doctor Who. (Though, let’s face it, it does. I know I know, it’s not a police box). Either way, this is a brilliant example of recycling and book loving and I just had to share! Check out the rest of the pictures at Offbeat Earth! You’ve probably heard “cat’s in the cradle,” if not only from the line in the Harry Chapin song, but you may not realize that this saying originated from a Dutch legend. The elaboration of the story seems to vary from place to place. The basic gist of it is that once there was a big flood of torrential waters, and while checking on the drainage after the storm, a man saw something floating on the water and realized it was a cradle. 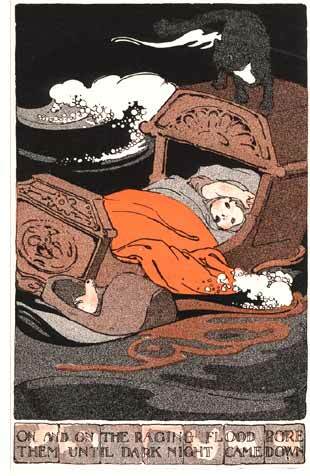 He decided that sadly nothing inside it could possibly be alive, because the water had been so tempestuous, but as it floated nearer, he saw that a cat was actually rocking the cradle back and forth in the water by jumping from end to end—apparently to keep the water out. When the cradle drifted close enough to the man, he was amazed to find a baby girl in the cradle, alive and well despite the long stormy night. Another source I came to says that the little girl had already once been saved from an untimely death—this was extremely long ago, when food and resources were scarce, so often baby girls were left to die in favor of raising up strong boys who could be warriors, but a girl child was allowed to live if they were ever given so much as a taste of food—milk, honey, what have you. This girl was meant to be left to die on orders of her grandmother (the matriarch in the family has all the say) but she was hidden by a nursemaid and her parents, and cared for secretly. The cat was a pet and became a playmate of the little girl, and supposedly cared for her more than for her own kittens, so when the flood came, the cat let her kittens fend for themselves, thinking that kittens are more apt to take care of themselves and run around and whatnot than a baby is, so the cat jumped into the cradle with the baby and they floated off together. This other reference also says that it was not a man but a boy that found the baby, and that eventually the two were married. It even says that there is still today a statue of the cat over the woman’s tomb, and that every year on Santa Klaas day (December 5th) the children in the village put a new collar on the cat’s statue, and remember the story about the cat that saved a little girl’s life. 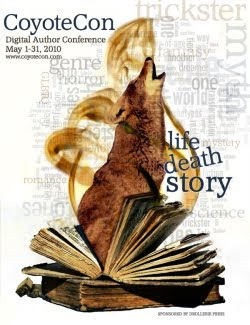 Drollerie Press is hosting Coyote Con, the “First Annual 31 Day Digital Author Conference,” to be held May 1-31, 2010. Best of all, it’s free (registration is required and to attend Special Sessions you need to obtain a ticket, which you can get here. There will be a wealth of topics discussed. I’ll be taking part in the three panels: DigitalLit, Fairytales in Fiction, as well as the YA panel, along with a host of other wonderful authors! Lisa’s Tuesday Perspective: New Additions to the TBR list. I went to a writer’s conference this past weekend, and couldn’t resist buying a book. I was really lucky to be able to win a door prize, too—which means another book for me, yay! I’m really looking forward to reading both of them and giving them a review here. The siblings soon find themselves with super-human powers, being taught the art of magic and swordplay by mystical beings. It isn’t long before they are struck with a realizationthey are training to become elves. I admit, at first glance, Älvor by Laura Bingham doesn’t really look like my cup of tea. I don’t know, even as a YA fantasy lover, I see words like “training to become elves” and I’m sort of tempted to turn away. But I read the first few pages of this and to be honest, I’m hooked. Bingham has a really lovely writing style that’s easy to read, and that grabs my attention really fast, and Erin and Bain are already making an impression on me, so I’m really looking forward to see how their adventure turns out. She’s had it forever. A tiny mark on her hand. No big deal, right? But when Tori discovers that her ordinary freckle is really some kind of microscopic tattoo, she doesn’t know what to think, especially after meeting Eric, a guy she feels strangely connected to–and not just because he has a mark too. This one really excites me. 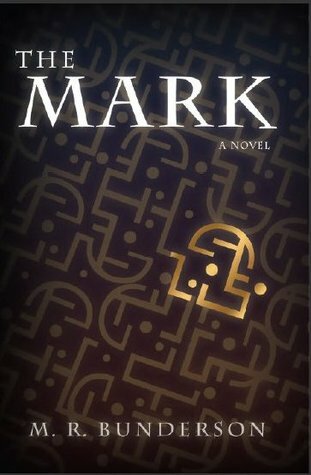 The Mark by M.R. Bunderson is quite simply a beautiful book. I love the cover design, the description on the back, the idea of a micro tattoo with some secret to it, and the fact that the tattoo image (at least, if that’s what is on the cover, as I’m guessing) looks like nothing I’ve really seen before. Not tribal or celtic or anything like that… it looks almost computer-ish, and that makes me really extra-curious as to the secret behind it. I haven’t opened this one yet, but I really can’t wait to read this. I want to know what Eric and Tori’s strange connection is—and I haven’t even started the book yet. That’s good marketing right there. Fun Friday Interview: Maggie Stiefvater! So welcome, Maggie! We’re super excited to getting to know a little bit more about you. First things first. Many of your characters have some sort of strong musical leanings… can you tell us a little bit about your own musical background? Music makes the world go ‘round. My mom put me at the piano when I was a tiny maggot, and then I picked up other instruments as I went: harp, guitar, bodhran (that’s a sort of Irish drum), tin whistle, and finally, in college, the bagpipes, which I played competitively for a few years. Yes, I know. You don’t have to tell me. Anyway, I love music. I have it playing all the time, Celtic, Classical, Alternative Rock . . . I have music playing right now. “I Love the Trees” by Nomos. I was just listening to “Walking the Dog” by Fun. before that. You’ve shown off some of your doodling on your Livejournal, what other hidden talents do you have? I swear, I have no other hidden talents beside art and music and writing. I can’t make tortillas. I am not good at sitting still. I can drive a stick shift. Does that count? Also, I can perform a cartwheel. What is your absolute, no-holds-barred favorite bit of the writing process? That moment when I write a scene and I know that it is going to hurt the readers in some way, either because it’s so, so bad or so, so good. I love to put characters in situations that almost break them, and the almost-breaking is fantastic — but so is the other side when they become giant and strong. We’re all about YA fantasy here. What is it about the genre you find so appealing? Teens are really powerful, passionate people. Who wouldn’t want to write about that? One day I might write an adult book, but for now, I love writing about that edge when you find yourself. Do you, have you, or would you work in another genre? Other than fantasy YA? I always tell people that there is something very lovely about a platonic shower with your boyfriend/ husband/ lover, but that I would never be able to write on in a YA though I really want to. One of these days, I will be unable to stop myself and will have to write an adult book because of that. When you see me come out with my first adult book, look for the shower scene. Because that will be the cause of it all. Your faeries really are nice and homicidal, aren’t they? You also seem to know faerie lore like the back of your hand. Was this all research you did for your books, or was it something you were already familiar with? Oh, I grew up with this stuff. I was a small, strange child like Coraline or Wednesday Addams, and I always had a fat, dusty tome of mythology in my lap. While other girls were telling you about fairy godmothers, I was advising you to hang open scissors above cribs to keep fairies from stealing the baby. Musicians are always being asked for their influences–who are your biggest influences in writing? Hm. Audrey Niffenegger, because she first gave me the “hmmm, I wonder” thought about alternative point of views, and also because she made me cry, which never happens, and made me want to do that to other people. Mary Lawson’s Crow Lake was lovely and subtle and taught me to trust my readers. Diana Wynne Jones taught me to use humor when things got bad. You have some seriously awesome music on your story soundtracks on your website. What music is inspiring you right now? Thanks! I am listening to “Eagle Eye” by Brian Tyler for a Super Secret Project I am writing. And I just handed the draft of FOREVER to my editor while listening to “First Floor People” by Barcelona. 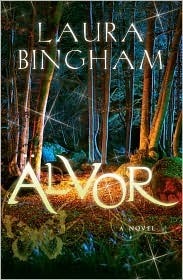 I loved Shiver and I’m really looking forward to the rest of the Wolves of Mercy Falls series–Not asking for specific spoilers here, but looking at it in comparison to your Faeries series, are we going to be sticking close to the characters we know, or get a closer look at some of the smaller characters from the first book in Linger and Forever? A little bit of both. Linger is definitely more a true sequel to Shiver than Ballad is to Lament. We definitely get Sam and Grace, but the world opens up a bit to include Isabel and a newcomer, Cole. I’m very excited to see how readers react to them . . . especially Cole, one of the most challenging characters I’ve ever written. I’ve just discovered your Merry Sisters of Fate blog that you’re involved in—can you tell us a little more about that? Ooh, yes! I write short fiction each month over there at www.merryfates.com, with my two critique partners, Tessa Gratton and Brenna Yovanoff. The theory was this: when I was a full time artist, I was part of a movement called “Painting a day.” You were supposed to start and finish a painting each day — usually a small one so you could manage it all. I did it for two years and so there are hundreds of Maggie pieces out there. And I got so amazingly better from year to year because of it that I decided that it would be fantastic to do the same thing with my writing. So we jumped in and started the blog, and for the first year, we each did a short story every week. Now we’ve cut back to once a month because we all have other deadlines going on, but man. Those first stories versus what we do now? It’s been amazing. Thank you so much for your time, Maggie! I can promise that the Hollow Tree plans on keeping a very close eye on you in the future! Thank you guys so much for the fantastic questions!! Be sure to check out Maggie’s author website and blog, and look for her books in stores! They come highly, highly recommended from the Hollow Tree Team! Okay, so yesterday we put up a review of Ballad: A Gathering of Faerie by Maggie Stiefvater, who we’ll be interviewing on Friday. A few days before, Isabelle and I geeked out about the book on instant messenger. This is the result. 🙂 We didn’t get super in-depth about the book, I admit, but we did squee… a lot. This might be the tiniest bit spoilery, so be warned! Lisa: I loved James. Oh man. Isabelle: He was sooo… you. Isabelle: I did have a soft spot for him though. Isabelle: And I was VERY angry when Dee kissed him. Lisa: I mean… I almost wanted her to give in and be with him. But when she started crying, I was just like… hell no. Isabelle: I know, me too. Lisa: Because really, I didn’t like Nuala a ton… I just wanted James happy. Isabelle: I LOVED the teacher. Isabelle: He just fascinated me. Lisa: OH MAN I KNOW. Isabelle: There was so much about him in general that worked for me… and then when he talked about his old experiences I kind of got shivers and was like, poor dude. Lisa: I was picturing him as Ed Quinn…. I’m a sucker for Ed Quinn. Lisa: Side note—he’s who I wanted for The Time Traveler’s Wife, too… but he’s a bit too old to play the younger years. Isabelle: Oh… and weird creepy roommate hearing the names and the song. Lisa: Yeah, I ended up really liking the roommate. Lisa: I LOVED the Ophelia conversation. Oh my goodness that was my favorite thing in the book. Isabelle: That was a really great scene. Lisa: That where he realizes that she DOES love him, just not the way he wanted… killed me. Isabelle: I know. The poor kid. He was really so hung up on her. Isabelle: I mean, even in Lament, where he sends her that last text. Isabelle: It makes my heart hurt for him. Isabelle: And I don’t even really fully feel Nuala was right for him. Isabelle: Though I was glad he was no longer caught up on Dee. So… maybe not the most professional review we’ve done, and I have to say, I do like Nuala… especially what she turns into and how she develops, she just takes some getting used to. Anyhow, be sure to come back for our interview with Maggie on Friday!